Believing that education is the key to human and national development and with his passion to help the needy and deserving, the underserved and under skilled youth of the CARAGA Region, Nicomedes A. Salas founded Saint Joseph Vocational School as a technical vocational school in 1971, now known as Saint Joseph Institute of Technology in Butuan City. From its humble beginnings in a rented two storey building made of wood and equipped with a few old typewriters and sewing machines bought in Surigao City out of his meager savings, the building became a learning hub for the first 130 students enrolled in vocational-technical skills courses complemented by 3 faculty members who started tinkering and learning basic livelihood skills. In three years, the vocational-technical school grew and became a college, opening its doors to technical and professional programs with expanding enrolment. Determined to meet the increasing needs of the growing student population and faculty, NAS acquired the old rented building in 1974, which was later renovated and completed in 1978. In November 1980, a five-storey concrete building was completed with the sister company Northern Mindanao Broadcasting Company housed on the fifth floor. To meet the expansion needs of the school, a 12-classroom pre- fab building was constructed and completed in 1985. In 1993, a five-storey concrete Nicomedes A. Salas (NAS) building was completed followed by the construction of the Leticia C. Salas (LCS) Engineering building completed in 1996. The latest addition to the campus of SJIT was the construction and completion of a 6-storey Nicole Joy C. Salas (NJS) building, an edifice symbolizing growth and expansion. Within a span of a decade, SJIT enjoyed a flourishing hub of learning activities for students and faculty. The program offerings expanded from just the vocational-technical skills courses to professional-technical courses to include Marine Engineering, Marine Transportation, Engineering courses as well as Liberal Arts, Commerce and Education. The student population leaped from 130 in 1971, and 500 in 1974 to around 3800 in 1989. By the stroke of fate at the point of a gun, the life of NAS was snapped and taken away. While this tragic event could have toppled and crushed the life of a flourishing school dedicated to “Education at its Best,” the turn and twist of events proved otherwise. The leadership and management of the school was taken over by the Vice President/wife of the fallen founder. The dream of the founder never faded with his untimely death, instead it became compelling, brighter and clearer, empowering the new President, Dr. Leticia C. Salas, to steer the institution to meet the challenges and take SJIT to greater heights of growth and success. In barely a span of 2 decades, the enrolment of SJIT hit the 5000 mark. Its programs expanded to include Master’s and Doctorate programs and the complete Basic Education. 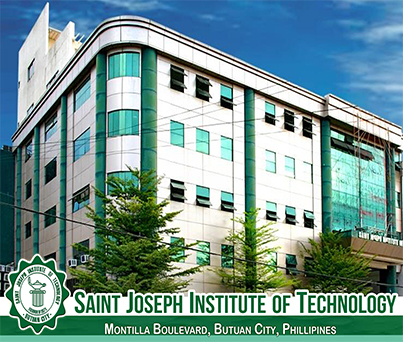 From scarce beginnings to sustainable growth, SJIT has expanded its infrastructure and school campus. The transfer of the Maritime Academy to a 3-hectare campus by the sea in Barangay Cubi-Cubi, Nasipit, Agusan del Norte, has been a dream come true, indicating its acceleration as an educational institution meeting national and international standards in Maritime Education. The beach front campus includes a 3-storey Academic Building comprising among others, Academic and Administrative Offices, classrooms, laboratories, simulators and mock bridge, audio-visual room, and a dormitel with a capacity of 500 students, faculty and staff quarters, mess hall and sports and recreational facilities. There is one Olympic-sized swimming pool. Soon to rise is the Maritime Training Center to be operated in January 2018.